Private Bradley Manning appeared in court this week for his role in releasing confidential information to Wikileaks in 2010. He has been held in prison without trial for over 1,000 days. His Martial Court trial, which began on June 3, 2013 is being held at the Fort Meade army base in Maryland. This article sums up the key issues raised by his case. Pvt. Manning was serving in Baghdad as a low-level intelligence analyst since 2009 and had access to the military’s high-security Secret Internet Protocol Router Network (SIPRNet). Manning admitted to one time computer hacker Adrian Lamo that he had sent classified documents to WikiLeaks in a series of chat logs partly published by Wired U.S. Lamo turned the details of those conversations over to U.S. authorities. Lamo testified during trial on June 4th. Manning was arrested in Iraq on May 26, 2010 and held in pre-trial custody in Kuwait and later in Quantico, Virginia for over 3 years. Manning will now face military prosecutors and will be asked to answer to 22 different charges, including “aiding the enemy” by violating Article 104 of the Uniform Code of Military Justice. Back in February this year, Manning pleaded guilty to 10 of 22 charges, admitting he sent documents to WikiLeaks to “document the true cost of the wars in Iraq and Afghanistan.” The Freedom of the Press Foundation – a U.S. based media group that defends whistle blowers and promotes investigative journalism – was able to publish a leaked audio file with the record of Manning’s full statement. Bradley Manning faces a jail sentence of at least 20 years. The most serious charge against him is the one related to possible advantages given to Al Qaeda by contributing to the leaking of classified documents – none of them were indicated as “top secret” – over the Internet with the help of WikiLeaks. To prove this allegation, the court has asked a total of 150 witnesses, who include members of the US Navy Seal that killed Osama Bin Laden, to testify against Manning, arguing that information downloaded from the WikiLeaks website were saved into computers found in the Pakistani Abbottabbad house were Bin Laden was found and killed. Andy Greenberg argues in his seminal book on political hacking “This Machine Kills Secrets” that the SIPRNet machines Manning was operating with “lacked most of the forensic monitoring tools that might have detected his abnormal searches and his repeated copying of that data to his camouflage rewritable disks.” Downloading and copying massive loads of classified data was an extreme easy job for Manning, as he was able to save downloaded data on a CD-RW labeled as “Lady Gaga,” take the compact disc with him and upload files to the WikiLeaks digital dropbox by using some common encryption and online anonymity tools such as Tor, SSL and SSH FTP. According to the Office of the Director of National Intelligence, 4,2 million people had access to the same data Bradley Manning handed over to WikiLeaks. Bradley Manning’s arrest and extended pre-trial imprisonment attracted the attention of human rights organizations and scholars. In 2011, 300 academics signed a petition asking to end the “humiliation mistreatment” of Bradley Manning, claiming the conditions he was held in were “degrading” and “inhumane.” According to the Bradley Manning Support Network, during the first ten months of incarceration, Manning was denied meaningful exercise, social interaction, sunlight, and on a number of occasions he was forced to stay completely naked. In March 2012, the UN special rapporteur on torture Juan Mendez reported Manning was held under “cruel” and “inhumane” conditions and forced to be “locked up alone for 23 hours a day over an 11-month period” in conditions that “might have constituted torture.” All this happened without Manning was found guilty of any crime or even any trial officially started. In a recent column on the New York Times, Floyd Abrams and Yochai Benkler wrote that “if successful, the prosecution will establish a chilling precedent: national security leaks may subject the leakers to a capital prosecution or at least life imprisonment. 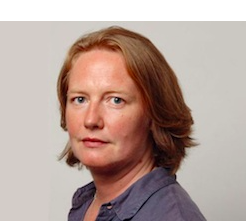 Anyone who holds freedom of the press dear should shudder at the threat that the prosecution’s theory presents to journalists, their sources and the public that relies on them.” Bradley Manning’s trial is probably the biggest freedom of information case of this decade. The Guardian newspaper issued a similar warning referring to “the increasingly aggressive stance the US government is taking against official leakers,” mentioning “six prosecutions under the Espionage Act, twice as many as all previous presidencies combined, of which only Manning’s has gone to trial” launched by the Obama administration. 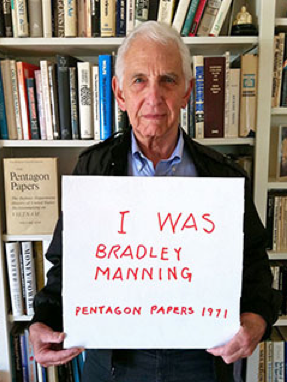 Daniel Ellsberg, the whistleblower who handed over the Pentagon Papers to the New York Times in 1971 and is the founder of the Freedom of the Press Foundation, has rallied and campaigned for Manning in different public occasions, including a recent sit-in outside the Fort Meade Base on June 1st, 2013. “I was the Bradley Manning of my day,” declared Ellsberg to BradleyManning.org in 2011. In a recent essay published in a book on WikiLeaks, scholar Patrick McCurdy compared Ellsberg’s and Manning’s case, pointing out that “just under two years after being indicted, and after a mistrial, the judge in case dismissed all charges against Ellesberg. The charges were dismissed because of criminal interference by the Nixon Administration […] During Ellsberg’s court case it was revealed that the Plumbers had previously broken into the office of Ellsberg’s psychoanalyst in an unsuccessful bid to acquire ammunition for an extralegal smear campaigning against Daniel Ellsberg. […] White House tapes released in April 2001 revealed that President Nixon was keen to seek retribution in the Pentagon Paper case.” During pre-trial hearings in January 2012, Manning’s imprisonment had already been claimed as “mistreatment” by Colonel Denise Lind. As a consequence of this judgment, Manning will receive a 112-day reduction on an eventual prison sentence. The military trial against Bradley Manning will continue until August and will be behind closed doors and no press will be allowed. The Freedom of the Press Foundation crowd-sourced funding “to place a professional stenographer in the media room covering the trial” and will publish full transcripts of trial sessions on its website.